There’s multiple ways to do dual. Single nozzle isn’t necessarily more elegant, just a different way that just trades negatives. This way requires a purge each layer it’s used, generally meaning more wasted material. It’s also less compatible with doing different material types since it has to change temps and purging between different plastic chemistries might add another degree of complexity. Also; Bondtech’s isn’t dual extruders, it’s dual drive pulleys in one extruder. To do dual extruder, you need two of his drive systems. “This is a feature, not a bug, and it means only the cool people come out to the event.” or, you know, those who can get away from jobs, family, and other commitments. I just received my Bondtech V2 extruder and I have to say the build quality is excellent. Not fired it up yet, still waiting on some extrusion from Misumi so I can finish building my Eustathios, but if the feel is anything to go by this thing will be awesome. Any idea where we can get the build instructions for this? I have the .stl files but no mention of hardware required. I assume he is releasing this open source. This is amazing I have dreamed of this since beginning 3d printing. I think he’s releasing the design eventually, but it’s not out of beta yet. Email the address on the site and he’ll hook you up with a link to the beta shopping cart. There are complete kits and also hardware kits. Most hardware is off-the-shelf, but the pulleys are custom made pieces. “Two Colors, One Nozzle” eh? You sure that’s safe for work? So the Cyclops is a dual-filament extruder in the space of a single-filament extruder? So does that mean you can do 4 color prints with 2 Cyclops extruders in the space of 2 single-filament extruders? Well, you probably couldn’t do it in the same “space”… but you could probably add an offset for one or both nozzles so they squirt in the proper spot. I’m guessing as I don’t have or have used a 3D printer that CYMK inks/err filaments are available? It wouldn’t be as good as CYMK printing with ink, trying to mix two colors on opposite nozzles probably wouldn’t work (just guessing). I think you’re quite right. 3D Systems CubePro C will blend colors. It used to be the botObjects ProDesk3D before 3D Systems bought them out. Wouldn’t two two color nozzles be a “Biclops” “Bicyclops” “Bycyclops”? 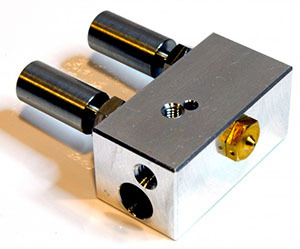 Note the difference between the hotend and extruder. You’ll need four filament drives to run four colors, no matter how you arrange them. You could use Bowden tubes, though, which would reduce the mass and volume of the printhead. Also — imagine a Cyclops-Kraken hybrid! Four colors, two nozzles — or even one, I suppose. the frog is beautiful, but the effort in generating the motive geometry to create this print surely eclipses the development of an extruder fed by two filaments. i’m not really up to date on 3d printing, but are there established toolchains for this type of extrusion printing? Oh yes, very established and very easy with a little bit of know-how and a quick shove in the right direction; very affordable too. One could EASILY be making prints at home with the level of detail of that frog with under $500 worth of parts if you’re good at finding the great deals on eBay. I’ve gotta disagree with that one. I built my delta for around $700; I could have done it for $600 but it would have been quite hard. The Cyclops alone costs £90.00, or $134. It’s totally possible, but it would require quite a bit of time and effort, along with another printer to RepRap off of. I think can can do dual extrusion for $600 in parts, but I contest the suggestion that it’s easy to make a build dual extrusion part. Even with spending more, there can be hardship getting the machine dialed in. And if you’re using bargain hot ends, the proposition gets pretty dicey. The know-how is out there to generate dual material designs, but one could argue it would help to make them more accessible. There are plenty of videos on how to do this with different programs. I’m told Solidworks 2015 adds .AMF file format support, but I’ve not seen it in use. Maybe there’s a YouTube video that demonstrates that. Right now, I regularly use the second extruder to lay down dissolvable filament as support material for engineering parts. It’s taken me about nine months with a few frustrated breaks in between to really dial in the process and grow some confidence in that process. When I was Director of R&D at MakerBot we developed tons of cool technologies like this that never saw the light of day until they were released as a patents (https://www.google.com/patents/US20130328228) or never released at all. There is literally a book we wrote with dozens of wonderful 3D printing technologies called the Repository of Cumulative Knowledge (The RoCK). It makes me ill to think the world will only experience its contents as patents. I wish MakerBot would create a small internal group that further develops these technologies and launches them as products for hackers. They don’t need to be consumer level products. Just get something out there. If only I were a poet, I might have the words to express how happy I am to see people make the products we never did. Also, change colors while the nozzle is doing infill. That’ll clean up some of the surface defects. RoCK, that’s poetic, did you come up with that? So what you are saying is that 3d printing has advanced in the last years because of patent expiration, but as soon as people could, they started patenting other things that don’t even get to be products? Well, that’s MakerBot for you.